I had been running an Asus Deluxe X99 platform for a while, first with a 14-core Xeon chip, which I sold. Since then I'd been running an OCed 6850k (could only get to 4.3). The 14-core machine was a beast for multicore work but slower for single core stuff, which was most of what I used it for. I became somewhat disappointed with the machine when I built a 7700k mini ITX machine was faster for my use case: computer programming with a memory hot IDE and some virtual machines. I was annoyed at having to put extra work into getting an X99 machine which, in practice, was slower than a simple mini ITX build. 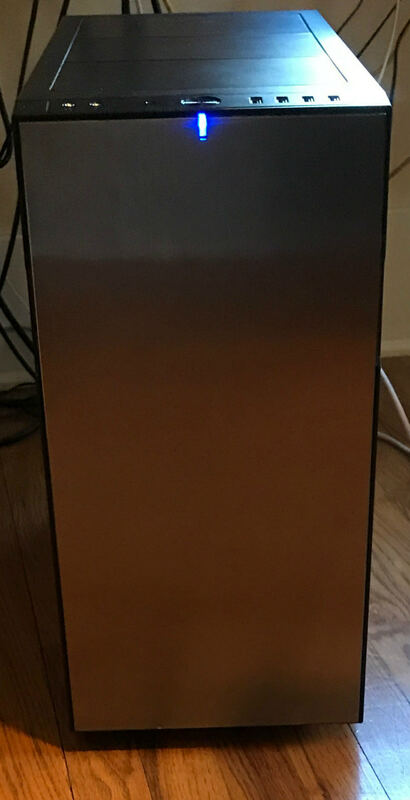 The 6-core Coffee Lake looked too good to pass up, so for under $600 I picked up the i7-8700k with an Asrock Z370 Extreme4. This build crushes the 7700k. Moreover, this was one of the easiest builds I've ever done, and I've probably done 10 by now. Once assembled, it booted in my first go using a lightly modified version config.plist from the 7700k machine. Compared to the nitpicky work I needed to do with the X99, this was a relief. After that I refined the config.plist, created an SSDT for USB following Rehabman's directions, created an SSDT for power management using a modified version of PikerAlpha's ssdtPRGen.sh, fiddled with overclocking the RAM and CPU. With a little tweaking, I was able to achieve a 5ghz overclock on the CPU (4.5ghz all core). I also overclocked my old 2133 MHZ memory to 2666 with no problem. All the necessary files are in the attached zip. Kexts are under "Other"
I used my MacBook to create a fresh install of High Sierra 13.1 on an external HD. I just selected the external and installed it. Then I downloaded the latest Clover, put a basic config.plist (the attached will work), installed FakeSMC, and booted into the drive. It worked first try! I then used SuperDuper to clone the drive to my 950 Pro SSD, and then installed Clover locally and copied over all of my kexts. Native boot worked and I was off and running to get my live system set up. I did some cosmetic things (RAM slots, for example) and set the CPU ID to 0x0906E9 (I could boot without this but my graphics card was wonkey), used iMac 18,3. I added ROM/MLB from a macbook to make sure iMessages and text forwarding works correctly. I added PikerAlpha's graphics patch to avoid Nvidia blacksreens. Nvidia Graphics Drivers from the tonymacx86 Download menu at the top of this page. Ethernet works easily with IntelMausiEthernet. I ordered a Wifi chip for the M2 key on and will add that soon. That should be straightforward given the work Toleda has done. LILU + AppleALC + RehabMan's fork of CodecCommander work perfectly with no editing. SSDT injects the correct ports and I have no problems. The USB 3.1 card I had from my X99 Deluxe also works plug and play. Basically, I fixed the vcore at 1.325, the DDR4 voltage at 1.3, set LLC to Level 3. For memory, I used some slightly looser timings. 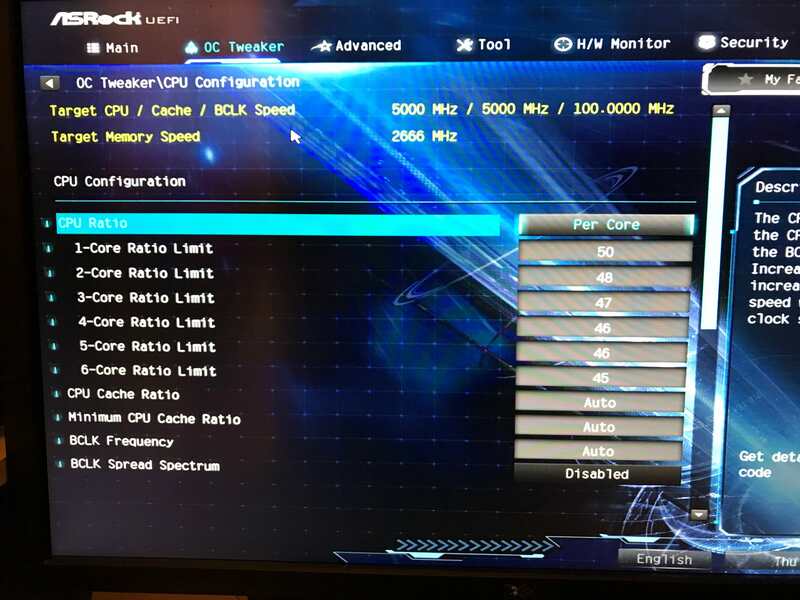 For CPU, I set the highest core to 50 cascading down to 45. I couldn't get a stable OC with an all core OC faster than 4.5 Ghz. Temperatures are idling at around 30c and peaking at like 65c during Geekbench. I ran a Handbrake test for above five minutes and peaked at 85c, averaging around 83 after warming up. I'm happy with that temperature under load for an 8700k, which can run hot. All in all, I love this build. The CPU is relatively cheap compared to old 6-core plus CPUs. It OCs to 5ghz stable without much tweaking. It's the fastest computer I've ever had on one of the cheapest motherboard's I've ever used. Thanks to macboy some advice on my first rendition of this post. Was able to trim down my config.plist a lot. 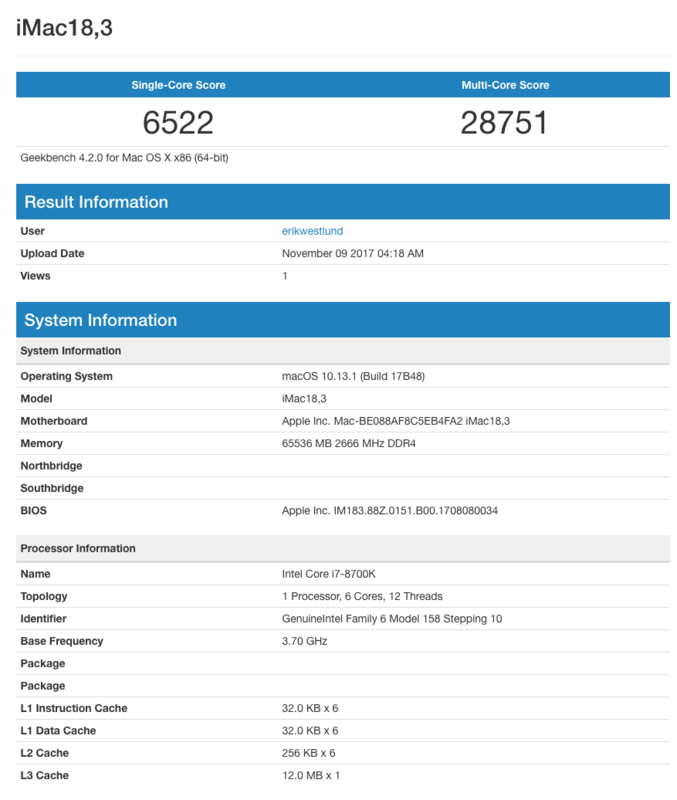 Congratulations, nice build, finally some Coffee Lake owners upcoming to share and compare. 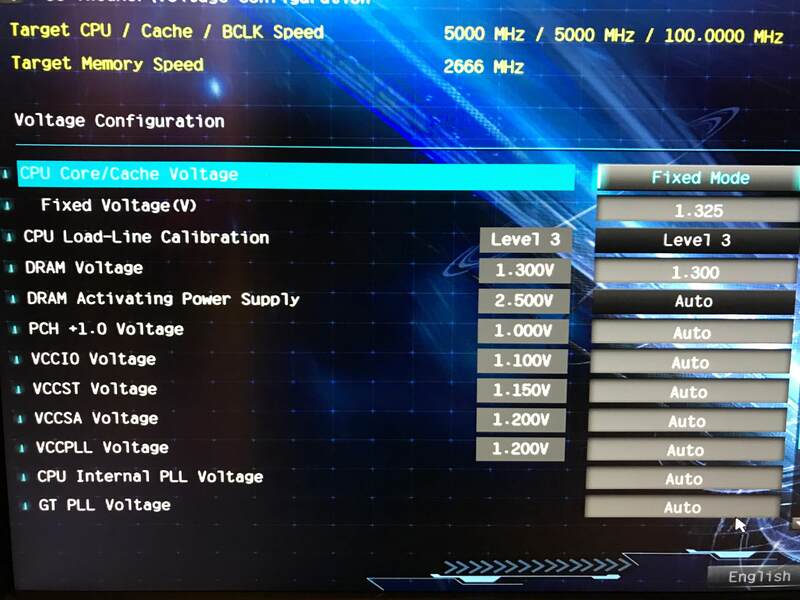 I set my Gigabyte AORUS Ultra Gaming to 5 Ghz Upgrade and Multi Core Enhancement, with that feature BIOS keeps dynamically setup of vcore, twp, etc. Interesting would be what temperatures you get f.e. with a 5 minutes encode with Handbrake. Geekbench only sets some less seconds peaks per different bench task and has no longer lasting load. According your config.plist you don't use iGPU. So no need for FakeID, DSDT and kext patches, ig-platform as well. NVME should be supported OOB in 10.13, not sure if you need to patch. Your SMBIOS is very detailed hard-coded, as 10.13 came up with some Firmware Updates, that prevented Hackintoshs with older Clover or hard-coded info from installing, it will prevent Clover from always using the newest available Apple Firmware infos and dynamically add infos. So better just define Model 18,3 and Serial. what WiFi/BT card are you using? is sleep mode working fine (with audio and all)? I trimmed out the SMBIOS too. With that, I reuploaded the files I'm using. I tried using CloverALC with layout port 1 and while the patch ran I got no sound. I didn't try much after that. Lilu + AppleALC works perfectly and I am a fan of the LILU project, so I'll stick with it. I popped in a DVD and ran Handbrake for five minutes or so. After warming up it averaged out at 82C or so and never went higher than 85. Here's a screenshot. Thanks again for your help. This build rules. Loving stable 5 ghz single core and 4.5 at six-cores. Really a great CPU. 1. I haven't installed the Wifi chip yet. It's on order through China. This is what I ordered: Broadcom BCM94352Z NGFF Dual Band 802.11ac 867M Wifi BT 4.0. I have this same chip in my 7700k Z270 Gigabyte Mini ITX build. RehabMan's FakePCIID + Broadcom texts + a single kext patch will make this work. You can search around and it's not hard to find information. As I do dual boot with Windows 10 and want to check out advantages in framerates with DirectX12 Multi GPU (from different vendors, so Intel+NVIDIA etc) performance I was happy to get iGPU and NVIDIA finally working, but was quite a long way because of ReAllocation errors of OSXAptio/2 with DSMT memory graphics stuff, INIT boot first iGPU and so on. Then the 3E92 pci ID of my UHD630 was not listed in KBLFramebuffer kext, so no accelleration and gIOScreenLockState hang, although it is the same GPU as in Kaby Lake, so I had to spoof KBL IntelFake ID for graphics, and ig-platform, which made it then finally neccessary to fake CPU as well. After that I got iGPU working in OSX and of course Windows. A had problems with audio as well till I disabled SIP, only then it was able to patch my kexts and load them with difference in signing verification. Then on the other hand for NVIDIA webdriver SIP had to be enabled, and coming from Z97 Haswell, I never had to use EMUVariable as it had native NVRAM support, but from 100 series chipset on, this is gone, so NVIDIA always switched back to OSX driver ;-) Till I added the EMU efi driver. I got pretty much the same temperatures around 83, except with MCE (Multi Core Enhancement == all cores on highest turbo clock) enabled in BIOS i'm on 89 degrees... with stable 5 Ghz... I think thats too high for gaming and rendering stuff, and as performance is really overwhelming I think i'll go one step back in tuning and run with 4,8 or stock, but with all cores. But it depends on if you're apps are more Multi Core, or Single Core, or even GPU bottlenecked. I'm still playing around for my prefered conf. There was a time when Gigabyte was first choice, but nowerdays you're fine with nearly every combination of Southbride, ALC and Realtek, Atheros, Intel Network stuff from ASUS, GB, MSI, to AsRock. The UEFI Bios is really nice as boot up times in Win and Mac are within 10 seconds. 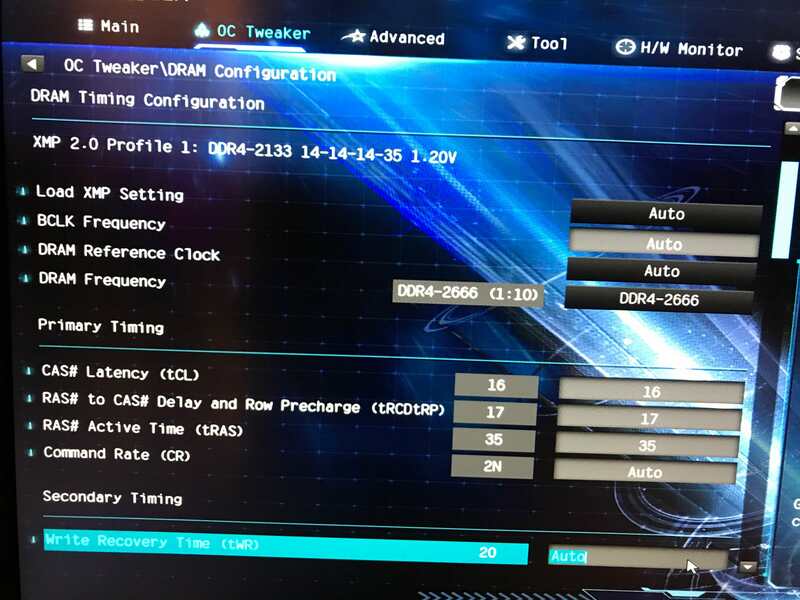 Even without Fast or Ultra fast what prevents my systems always from F2 or DEL BIOS entry, I need to shut down power and get to BIOS with that setting. I really was disappointed with APFS and 10.13, but after enabling all the hardware, PM with SSDTPRgen.sh, and finally DISABLING TRIM (some sort of boot time problems with SSD AND APFS) i got back to my fast booting macOS. Think you're AsRock Extreme should have Multi Core Enhancement as well. 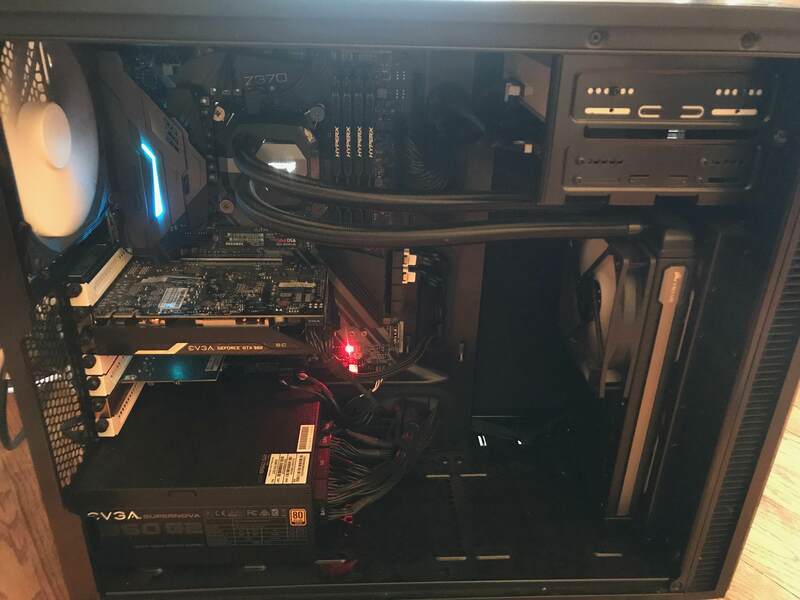 I'm really happy with that build, and as i said performance is really nice when you look at the prices of X-Series enthusiast builds and their performance in single and multi core. Yes, it has multicore enhancement. I took the route of individually setting each core speed. So I get all core turbo of 4.5. I don't think I need the multicore enhancement. Draws extra power, creating heat, when it will naturally turbo all of them up to 4.5 when my system needs it. I gave up on getting a good OC using MCE because I just had more luck with the per-core adjustment. At one point I was able to get like 29,900 multicore on Geekbench. But it just wasn't stable. I found that when I jacked up the bottom core speed past 45 or 46 is when I faced the most stability problems. I'm happy with the single-core at 5GHz (really speeds up things I do, like running unit tests for my software) and the 4.5GHz across all the cores. MCE is a tweek/tuning which leads to different bench results. To really compare, everyone should turn it off and not let it on Auto, because what Auto is doing, decides the BIOS of the vendor. By the way these geekbenchs also depend on DDR4 timing and frequency. So everything round about 6000 and 30000 is ok and get's near to Ryzen CPUs, which are in reality not so fast as on the paper. In Gaming and Rendering Intel still has some software dependend optimizations from all the companies. Right, I know some of the ASUS mobos with MCE were doing crazy volts. I OCed by 2133 ram to 2666. It can go a little faster but who cares. It's not something I'll ever notice. I'm happy at 8700k stock memory speed. I considered upgrading to RAM rated at 3000 or so. But the prices now are absurd. I bought this 64gb DDR4 2133 kit for $230 two summers ago. THE SAME KIT is selling for $675 now. Absurd. I'm happy with my modest overclock instead of dumping a pile of money into an upgrade. Hey Erik, lovely build there! Strangely enough my Hackintosh history is much the same as yours. Started with high core count machines that were a pain to get working (X99 meanies) and found lower end builds with faster single-core cpus were performing better. So was about to go with a 7700K when I found your build guide. Hell we even have the same monitors and case! Wondering if you can suggest any different hardware purchases for 8700K Hackintoshes? Particularly with regard to motherboards? Also, any reason why this might not work if going with Sierra instead of High Sierra?